Years ago, they were all the best of friends. But as time passed and circumstances changed, they grew apart, became adults with families of their own, and began to forget about the past—and the terrible lie they all shared. But now Gordon (“Go-Go”), the youngest and wildest of the five, has died unexpectedly and the other four have come together for the first time in years. Suddenly each of these old friends has to wonder if the dark secret they’ve shared for so long is the reason for their troubles today . . . and if someone within the circle is trying to destroy them all. 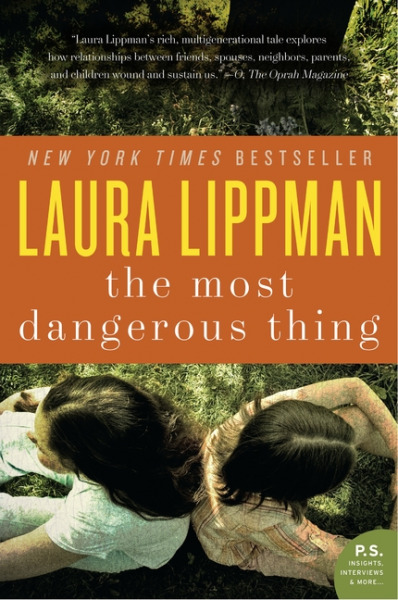 Laura Lippman has been awarded every major prize in crime fiction. A recent recipient of the first Mayor’s Prize, she lives in Baltimore, Maryland, and New Orleans with her husband, David Simon, stepson, and daughter. The novel’s epigraph is a poem by John Greenleaf Whittier and includes the lines “. . . pity us all, Who vainly the dreams of youth recall.” Talk about the meaning of this line and how it relates to the story. Describe each of the characters in the book, both the parents and the children. How did the parents contribute to the people their children were? Were the five children really friends? What drew them together? How did their bonds shape their adult lives? How do they all see each other now? Has adulthood transformed them? Go-Go is often referred to as bad. Was he a troubled child or just a handful? How did being around older children influence his behavior and who he was? Could Gordon have been saved if he came clean about the truth of his childhood? Was his death a suicide? Why did he go back to drinking? The children spend much of that summer in the wooded park near their house. What did the woods symbolize to them then and now? What about their parents? What role did Chicken George play in the five youths’ lives? What was their fascination with him? How can a person be fascinated with—yet so incurious about— another person like Gwen and company were about Chicken George? How much of their lack of curiosity is their age and how much the kind of people they are? The novel is told from the perspectives of both children and parents. How does this shape our understanding of the events that happened that summer, and especially the weekend of the hurricane? Why are children’s impressions of their parents’ lives often very different from the reality? Do adult secrets impact children’s lives? Trace the lives of one parent and child to enhance your thoughts. How does Laura Lippman build tension as the novel unfolds? How do we know something bad happened between the five friends? How has that event trickled down throughout each of their lives and the lives of their parents? “Clem believes every profession covers for its incompetents. So do families. Any group, no matter how loosely affiliated, will always close ranks against the world at large.” Do you agree with Clem? What is the impact on individual lives and on society itself for all this covering up? Why are parents so eager to protect their children from pain—whether it’s getting emotionally hurt or having regrets? Isn’t pain part of maturing? As a nation, are we overprotective of our children? How do today’s parents compare to the generation that came before? How and why have we changed? If you were a child growing up in the seventies and eighties, how has life—and childhood itself—changed over the years? Do you agree with Clem that very few things about people have changed in his lifetime? Are our concerns and fears about houer children real, or are much of our notions of the bad in the world products of a dark imagination fueled by the media? Can Mickey, Go Go, Tim, Sean, and Gwen be excused for their actions because they were “only children”? At what age should a person know the difference between right and wrong? Are we too permissive or forgiving of youth? Is it right that a parent is willing to kill for a child? Is vengeance a sign of manhood? Why can some people forget the past so easily? Is there a price to be paid for burying the past? What power do secrets and guilt have in shaping our lives? After Go-Go’s death, why couldn’t Gwen leave the past go? Mickey thinks talking is overrated, that talk, talk, talk makes things less real. Clem once agreed with a writer from the forties that confession was a palliative, not a cure; that “confession was good for the soul in the same way that a tweed coat was good for dandruff.” Gwen believes that isn’t that we talk too much or too little, but that most people choose an all-or-nothing approach. What do you think of their viewpoints? Do we talk too much, confess too much? Or is all that talking a way of circling problems without really touching them? If we only share select things, is that still being honest?